We use when we hit silicon seal of adhesion of canvas and gap of glass. The tape which can be masked on the canvas has been saved because I did not know until now. This review is about item#9152272. Although it does not mean that it does not stick to it, it is good if the adhesion strength is a little stronger. It falls down in heavenly skies. This review is about item#09152272. This review is about item#9152281. Outside of winter, it is very helpful with strong adhesive power, but in the cold winter, the adhesive strength drops extremely and it does not become usable. The paper itself was solid and firmly attached to the roughened surface. Although the price is high, I think that it is worth a try. This review is about item#09152306. Well it is a maker item so there is no mistake and it is the lowest price. This review is about item#09152281. Compared to Scotch's sealing and masking tape 80S, there are the following differences as personal impressions. 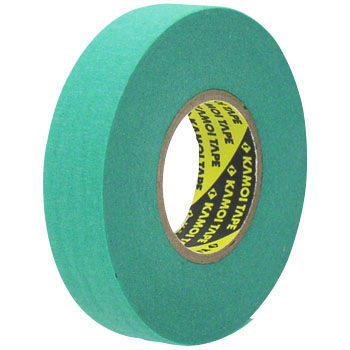 · The thickness of the tape · 80S · the surface wind god = there is roughness 80S = the slippery adhesive force is almost equal (the wind god is slightly weaker? ), But the caulking construction of the convex-concave surface is thicker than the side of the rough surface so much I felt like it was not done. Ultimately it may be a difference of preference. Paste the manuscript on the concrete side, put out some stains. It does not attach at all. Blue masking is attached. Do not buy anymore. This review is about item#09152297. For a long time I have used curing cloth tape, but this time I purchased it for the first time and used it, surprisingly with a firm firm adhesion strength, it is not less negative than a curing cloth tape, I understand the meaning of naming again, and I was able to work quite relief on windy days. In the case of a work that can not be fixed mechanically, only by fixing with double-sided tape, the cutting oil was soaked, the adhesive strength weakened, and the work was displaced. I added a fixation with this tape that was at hand as an assistant, but I got a firm fixation. The tape does not stretch too much, it is hardly affected by cutting oil during work, it is easy to peel off, there is no adhesive residue, post-treatment is easy, and working efficiency increases. But, somehow, cut the tape, glue remains on the blade of scissors. However, this tape can be removed cleanly by peeling it off the top of the paste, so it is not too much trouble. I think that this tape is mainly used for painting, but it is easy to peel off · Easy to peel · Strong tape, so it was perfect for fixing the tape which must be finally peeled off like this. Although it is a bit expensive, I will not use other tapes. Used on the 2nd day after painting of Xira, it is useful because it adheres well. Because the masker peels off the iron grid painting of the block wall at the time of the rainy season, we buy this closely to the concrete block purchased and it was good without the masker peeling off by the wind.